Rats were as motivated to help strangers of the same strain (SD stranger; right) as they were to help cagemates (SD cagemate; left). In both experimental conditions (diagrammed at top), SD rats were housed with another SD rat. However in the cagemate condition, the cagemate served as the trapped rat (‘a’) whereas in the stranger condition, the trapped rat was a stranger (‘?’) and not the cagemate (‘b’). Across the days of testing, the median latency to door-opening (bottom) decreased for both conditions. Rats of the SD strain helped trapped rats of the LE strain only if they were familiar with an LE individual. Three experimental conditions are diagrammed at top. The free rat was always from the SD strain and was housed with a cagemate, denoted at top, from either the SD (white) or LE (black and white) strain. The free rat was then tested with an LE rat that was either the cagemate (‘a’) or a stranger (‘?’). Note that in the LE familiar condition (right), rats had previously housed with an LE rat (illustrated) but were housed with an SD rat (not illustrated) at the time of testing. 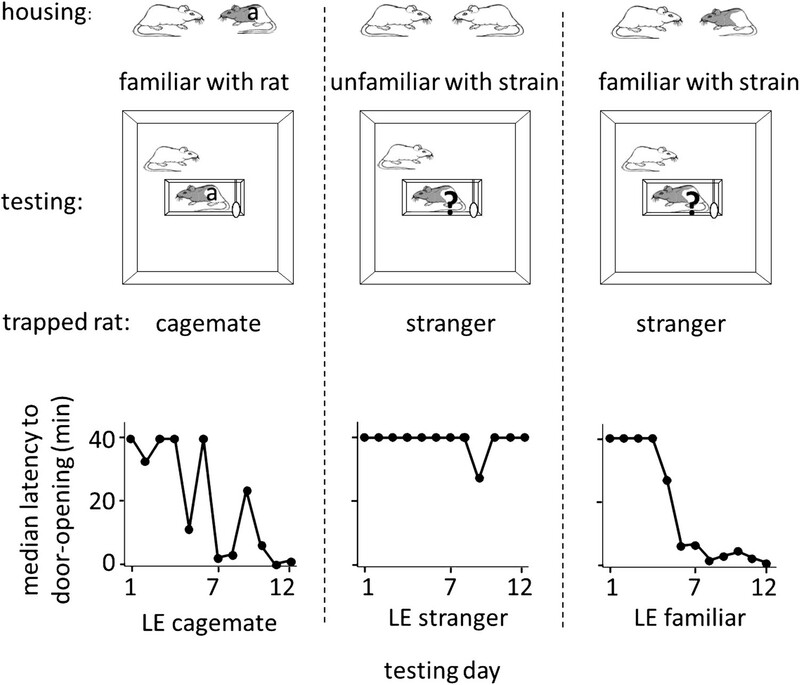 Across the days of testing, the median latency to door-opening (bottom) decreased for SD rats tested with trapped LE cagemates (left), but not those tested with LE strangers (middle). Like rats in the LE cagemate condtion, rats in the LE familiar condition (right) also became openers. Fostered SD rats were minimally exposed to other SD rats from birth. This diagram indicates how many LE pups (black dots) and SD pups (red dots) were present in each litter during postnatal (P) days 0–14 (x-axis) for rats in the fostered+LE (A) and fostered+SD (B) conditions (see Figure 4). On P0–P1, two SD pups (n = 32) were transferred into each LE litter (n = 16). If both pups survived one of the two SD pups was removed at P6, leaving a single SD pup with an LE dam and LE littermates. As red dots indicate other SD pups, the number of red dots is representative of the amount of exposure each fostered SD rat had to other SD pups during their lives. Individual rats are arranged from the most exposure to SD rats (upper left in each group) to the least exposure (bottom right). Following P11, no fostered rat was exposed to other SD rats until testing. In two cases (both in the fostered+SD condition illustrated in B), the SD pup in the LE litter died at a later date (P11, P12). In these cases, an SD male who had been removed from an LE litter 5 or 7 days before was then re-added to the LE litter. Note that only one animal (upper left in B) was exposed to SD rats with his eyes open; this rat proved to be the only door-opener in the fostered+SD condition. Lines above the dots represent the strain of the dam (red: SD; black: LE). Strain familiarity, even to one’s own strain, is required for the expression of helping behavior. 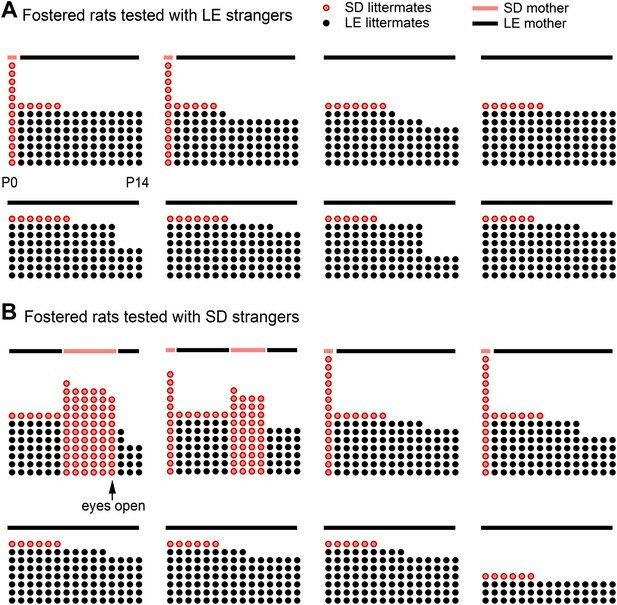 Fostered SD rats were raised with LE rats from birth (top diagram) and were not exposed to or able to interact with other SD rats prior to testing. When fostered SD rats were adults, they were tested with trapped stranger rats (‘?’) of either the SD (left) or LE (right) strain. Fostered SD rats did not help trapped SD strangers. In contrast, fostered SD rats helped trapped LE strangers. (A) Fostered rats (left of dashed line) spent more time at the arena corners during open field testing than naturally reared animals (right of dashed line). (B) The proportion of rats that opened increased across the testing sessions for rats tested with familiar strains (open markers) but not for those tested with unfamiliar strains (filled markers). 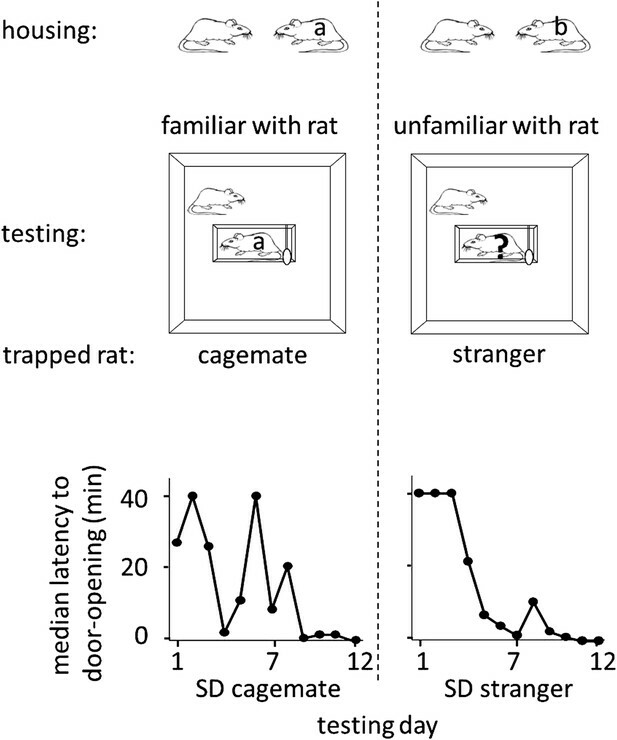 (C) No differences between rats tested with trapped rats from familiar strains (white bars) and those tested with rats from unfamiliar strains (gray bars) were observed in the average number of alarm calls or the amount of time spent at corners during open field testing. Rats experience helping rats of a familiar strain as rewarding. 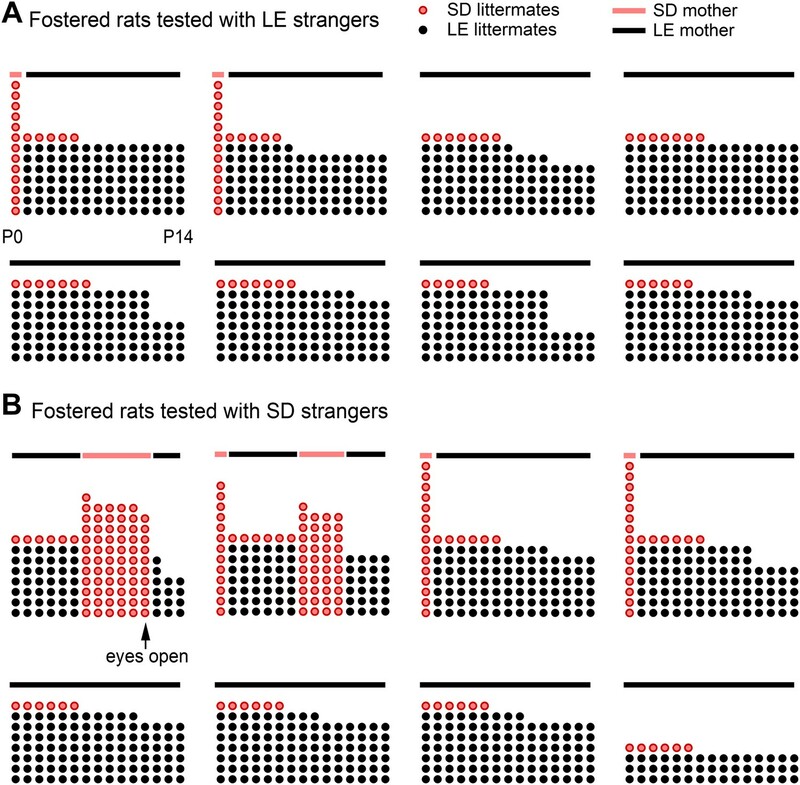 (A) The latency to door-opening decreased along the days of testing for rats tested with familiar strains (open circles) but not for those tested with unfamiliar strains (filled squares). 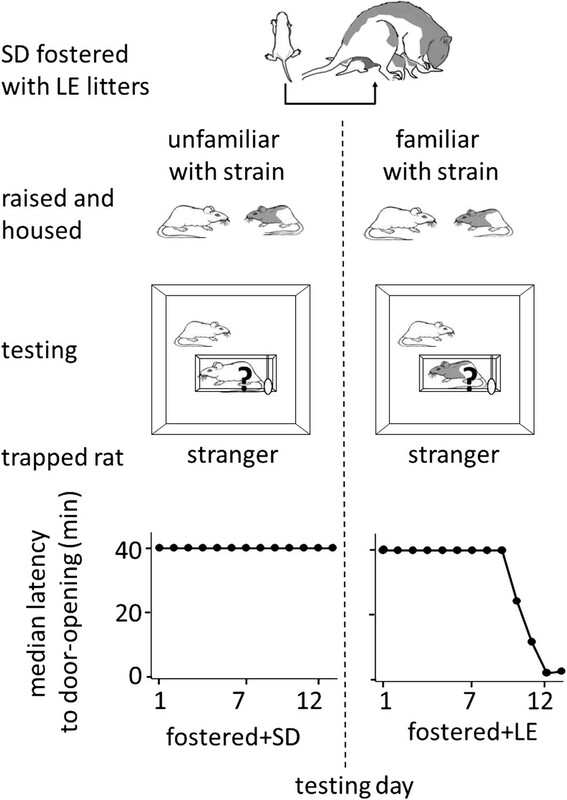 (B) The proportion of openings that were followed by a repeated opening on the next day of testing was higher for trapped rats from familiar strains (left of dashed line) than from unfamiliar strains (right of dashed line). (C) Opening data from representative rats of each condition are illustrated. Fostered SD rats were tested for 13 days. 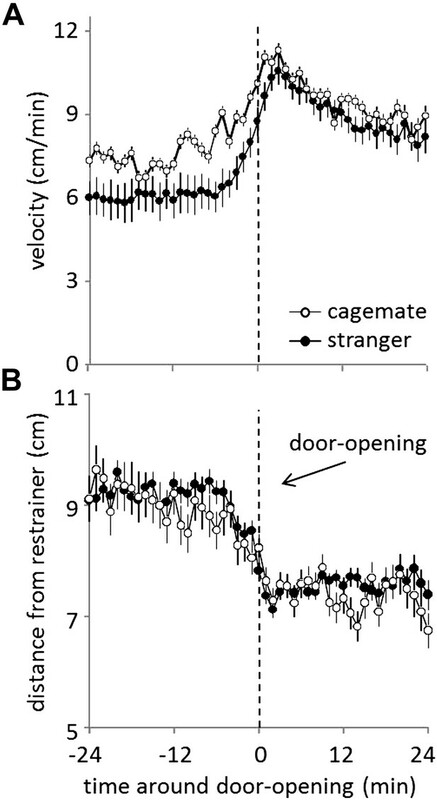 Prior to door-opening, rats are equally motivated to help, but show more activity for trapped cagemates than for strangers from a familiar strain. (A) Across conditions and testing days, rats tested with cagemates (white circles) were more active in the period before door-opening than were rats tested with strangers from a familiar strain (black circles). (B) The distance from the restrainer was not different for rats tested with cagemates (white circles) and strangers from a familiar strain (black circles). Openers showed an affiliative behavioral pattern. (A) Rats that became openers (left) spent more time around the closed restrainer (open bars) and fought less with the trapped rat (gray bars) than did non-openers (right). (B) The first day of repeated opening was correlated with time spent at the corners during open-field testing for openers (top) but not for non-openers (bottom). (C) Averaged across the 12 days of testing and regardless of strain familiarity, non-openers were less active when the restrainer was closed (white bars) than when it was open (gray bars). 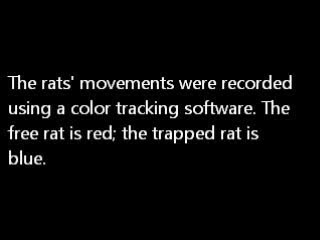 Rats help rats of a familiar strain. Rats that are familiar with at least one LE rat show interest in, open the restrainer door for, and rarely fight with trapped LE rats. Rats that are unfamiliar with LE rats show little interest in, do not help, and often fight with an LE rat. Fostered rats do not help rats of their own strain. Normally rats show pro-social behavior toward rats of their own strain. However, SD rats raised exclusively with LE rats and in isolation from other SD rats did not show interest in or open for a trapped SD stranger.